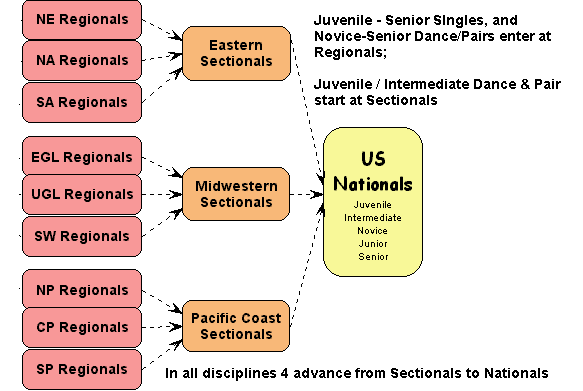 Qualifying Competitions in the USFSA include Regionals, Sectionals, and Nationals. Qualifying events at each Regional range from Juvenile through Senior in singles and from Novice through Senior in Dance and Pairs. The top 4 competitors in each division advance to Sectionals. The top 4 competitors from each division at Sectionals advance to Nationals. Juvenile and Intermediate Pairs and Dance skaters enter directly into their appropriate Sectional event, then the top 4 move on to Nationals.